Over the summer at the Rumpus Room, Archaellys and I grew a few tomato plants and they seemed to ripen all at the same time. What do you do with a metric asston of tomates? Make salsa, of course! Now my only thing is that you really need to taste test as you go because all the fresh ingredients will need to be adjusted depending on their flavors so my measurements are SUPER ESTIMATED. Just as an example, jalapeños will differ in heat. Just trust me, taste as you go and be prepared to adjust. NOTE: you most likely will be disappointed if you use store bought tomatoes because they’re not as flavorful as homegrown or those from the farmer’s market. Fresh tomatoes, preferably romas from the garden or farmer’s market. Slice your tomatoes in half and remove some of the seeds. You don’t have to remove them all, but, you don’t want a super seedy salsa. Put them in your food processor. Rough chop the onion and one jalapeño and add to the food processor. Tear the cilantro into the food processor bowl, add the juice of one lime and the garlic cloves. Pulse until it’s almost the right consistency for your tastes. Make sure to taste test your salsa. If need be, adjust your salsa with more jalapeño, lime or salt to get the right flavor profile. You can eat it immediately or let it sit for a few hour (or overnight) to let all the flavors marinate. For chunky salsa, just do a few pulses in the food processor. For milder salsa, remove the seeds and ribs from the jalapeños. 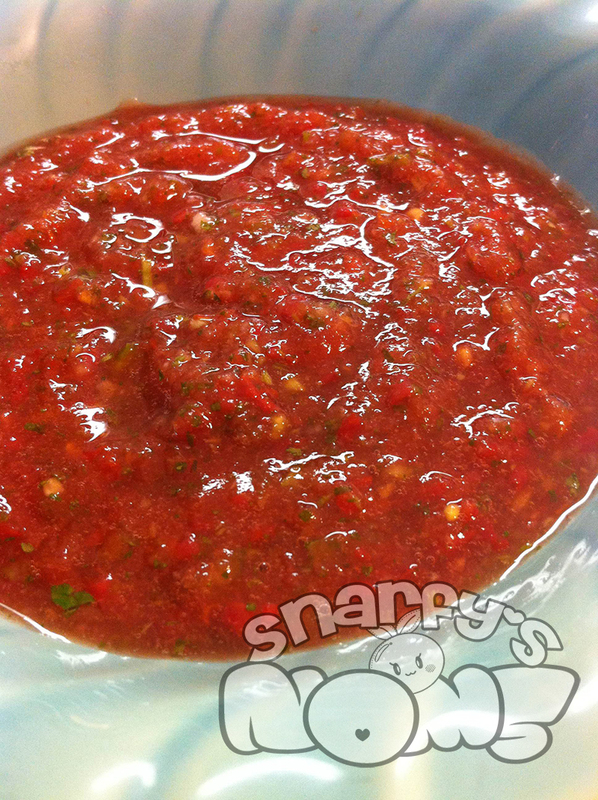 I’ve made the salsa before using garlic powder instead of fresh garlic, so you should be fine. I just like using garlic powder and salt separately so I can better control the amount of salt I’m using.